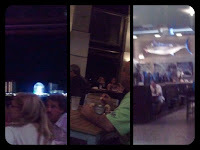 I was in Pensacola to get away for a few days and wanted to have dinner with a few friends. 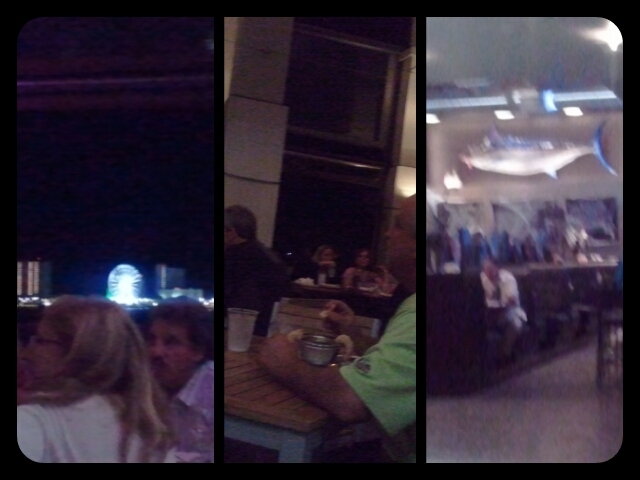 We got into the car to go in one direction but ended up at the Grand Marlin on Pensacola Beach. I thought it was one of those fancy places reserved for special occasions. Not so said my friends. We decided to get a couple of appetizers to start off our meal. One of my friends really liked the mussels on a prior visit. It has roasted tomatoes, garlic, white wine, butter and basil in the sauce. It's served with two huge slices of buttered bread. These has got to be some of the smallest mussels I have ever had. It must have something to do with it being the season because they were downright scrawny. 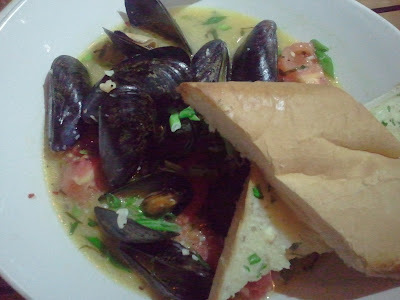 The sauce was delicious but I have had better, namely Bone Fish's Mussel Josephine. Be forewarned, there's a $2.50 for extra bread if you want to sop up more of that delicious juice. 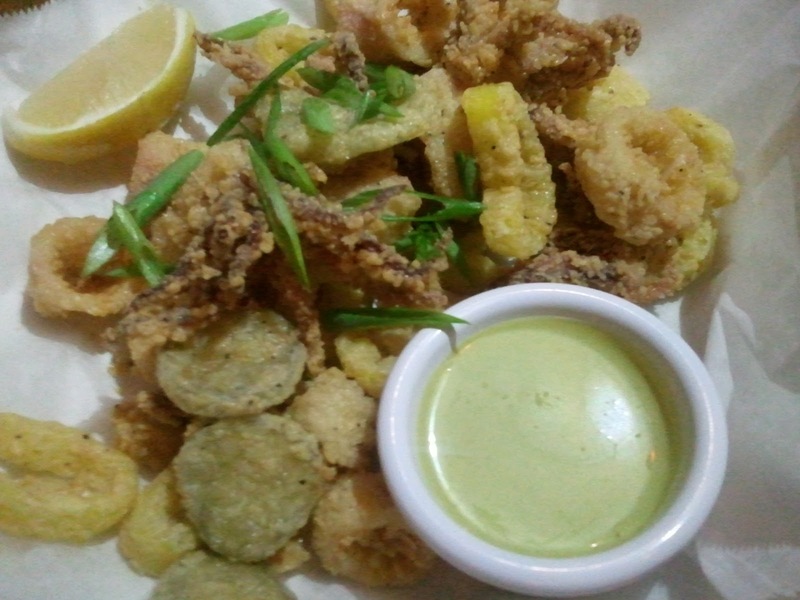 The second appetizer we ordered was the "Salt & Peppers" calamari. It's crispy fried squid with sweet and hot peppers served with a habanero lime aioli. Talk about stretching a dish. TGM fries up maybe two squids, pickles slices and sliced banana peppers then sells the whole shebang for $10. Really? I was expecting a lot more from TGM. I also wanted more from the aioli. I was expecting a spicy sauce with a lot of dimension. What I got tasted like wasabi mixed with mayonnaise. At this point, I was wondering if I am paying more for the view than the actually food. My dinner companion decided on the chef's special for her entree. 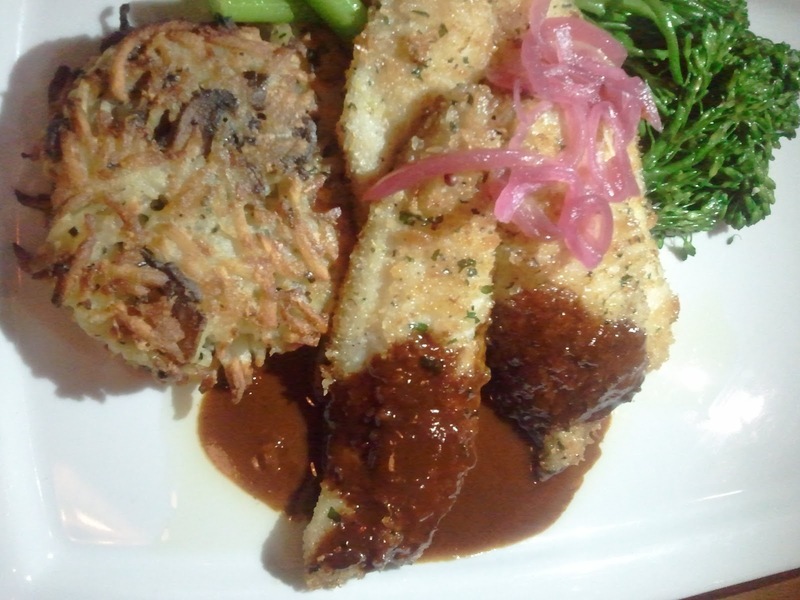 It was citrus crusted south Florida Pompano served with mushroom chive potato cake, garlic sauteed broccolini and creole meuniere sauce. All of my friends know I write a blog and happily gives me a taste of their food. In this case, I just tasted some of the fish. I thought it was very good. The fish was flaky and the crust well seasoned. The meuniere (brown butter) sauce was very rich and a bit spicy. It must be that creole seasoning. It was one of the more expensive items on the menu at $25. 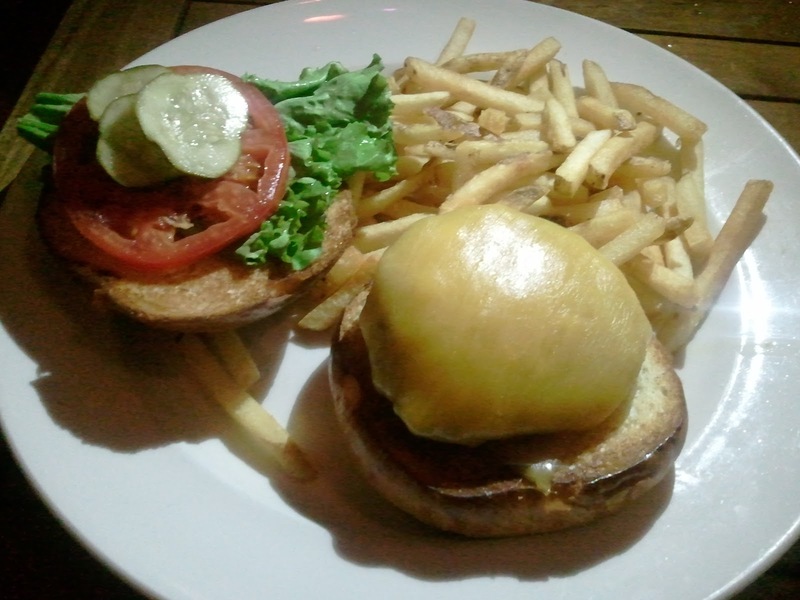 Another friend ordered the TGM Cheddar burger with Tillamook cheddar cheese, lettuce, tomato, house-make pickles and served with french fries. He ordered it well done and the third that I had was more on the medium side. I thought it was good but the other two people who tasted it thought it was on the bland side. They say, the meat patty tasted like there was no seasoning on it besides salt and pepper. I personally think the burger patty should be able to shine on it's own and I think this one did. 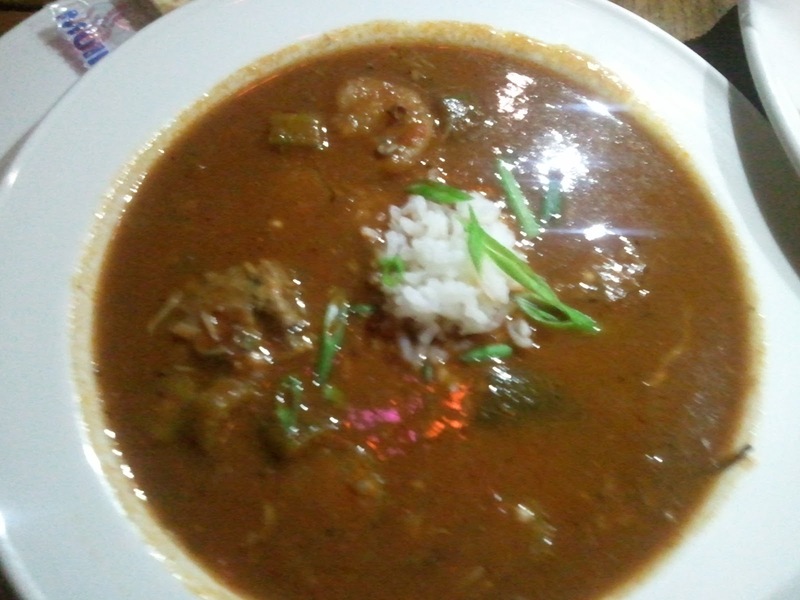 That same friend also ordered the Seafood Gumbo as an appetizer. TGM's version has shrimp, crab, oysters, andouille sausage in a classic dark roux. I had some and thought the soup had a lot of seafood flavor. 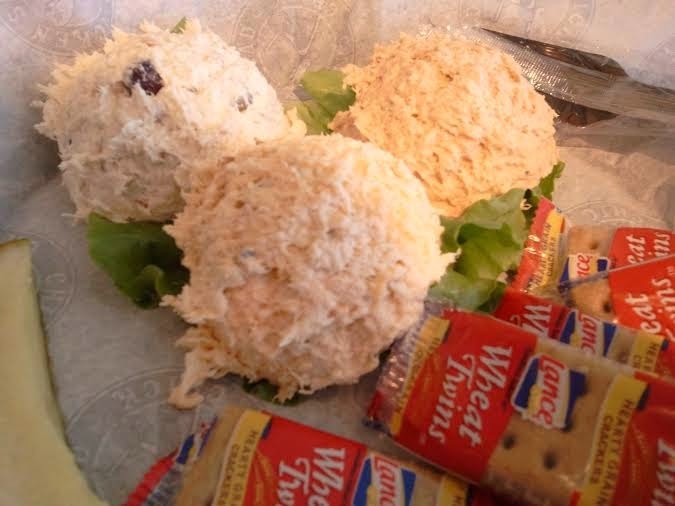 I didn't see a lot of shrimp, crab or sausage floating around in the bowl though. There were two visible shrimps and the rest was rice and veggies. When asked how it was, he answered "it was ok." Hm, so does that mean he liked it or not? With him, that's usually a no. 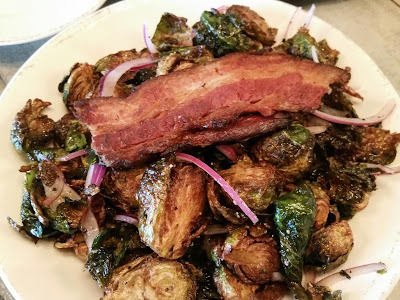 I decided on a relative light entree. I got the roasted beet with goat cheese salad. There's arugula, strawberries, candied pecans, radish, apple mint vinaigrette, roasted beats and Alabama goat cheese. There's two or three different color beet slices on my plate. They are very tender and juicy. The goat cheese is whipped so it's light and fluffy. I liked that it was a bit deconstructed so i can eat as much or as little of the goat cheese with my salad as I want. 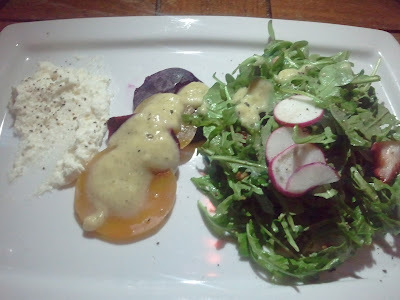 The apple mint vinaigrette was very refreshing on the greens and on the roasted beets. I enjoyed my entree and my friends' a lot more than the appetizers. Since I was on vacation, I decided to have a little drink with dinner. 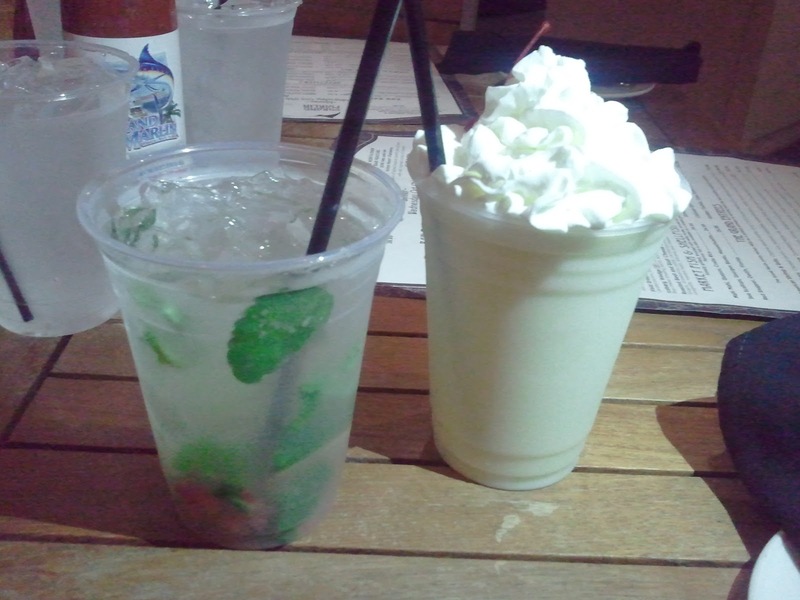 I got the Pineapple Mojito. I was surprised when it came out in plastic cups. It's no biggie but doesn't quite fit the entire theme of the restaurant I thought. The mojito was delicious. It's not too sweet and very minty. It still packs a good punch though. My preggers friend ordered a virgin pinacolada. She says it may be one of the best coconut pineapple shakes she's ever had. Silly lady. I have to admit the best part about the TGM has got to be the view. During the daylight, the view of the water is breathtaking and the nighttime view isn't bad either. It's great to look across your table and see the big 360 Observation wheel lit up. If you prefer a more climate controlled environment, the indoor seating area isn't bad either. It looks very comfortable. We had Bobby as our server. After taking a seat, he came by and introduced himself and took our drink orders. He brought back the drinks in a timely manner. We wanted to order appetizers but he rushes off to help the big party seated next to us. They get their desserts and coffee before he even returns to our table. It was at about the 10 minute mark when Bobby came back. We put our order in. The food came out at a good pace but we didn't get much attention from our server until that large party has left the building. I understand he probably got a better tip off that group than our four top but TGM should have had another server nearby to help out so no one feels neglected. It wasn't terrible service but it could have been better. To check out the Grand Marlin's website, click here. TGM also post their daily specials on their Facebook page.